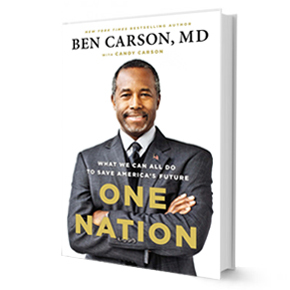 Dr. Ben Carson’s best-selling book One Nation: What We Can All Do to Save America’s Future is a NY Times best-seller and lays out his vision for America. The former Johns Hopkins neurosurgeon is revered by millions of Americans for his honesty, integrity, and frankness. Dr. Carson rose to political prominence after speaking at the National Prayer Breakfast. In that address, Dr. Carson spoke of his disdain for political correctness and his anxiety about the moral decay in America, and confronted the issue of debt and our fiscal policy — then he took on Obamacare. As President Obama watched from just a few feet away, Dr. Carson revealed his plan for health insurance for all. In less than two minutes he outlined his common-sense approach to health savings accounts — providing health coverage for all Americans without government intervention. The media has been buzzing ever since. Dr. Carson warns of the political correct “police” and “media bullies” who are drowning out conservative views from the public square. He says secularism is rising and Christians are suffering persecution. One Nation outlines Dr. Carson’s mission is to restore America to the ideals of the Founding Fathers. Read it. Learn from it. Share it!